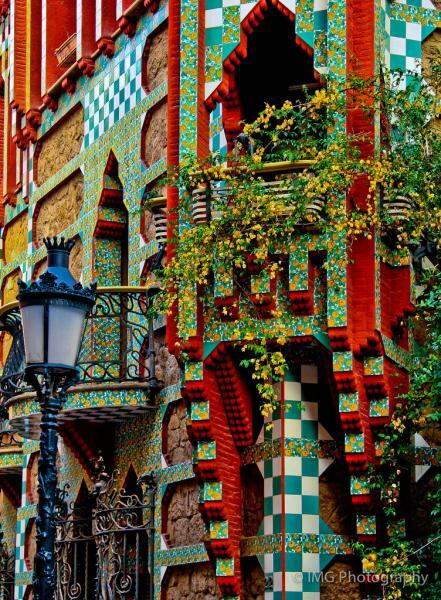 Recently opened to public for the first time in 130years, Gaudí’s first independent building, the Casa Vicens (1883–5) is a clean break from academicism (or as the pompous Penguin Dictionary of Architecture puts it, ‘a nightmarish farrago of Moorish and Gothic elements’). 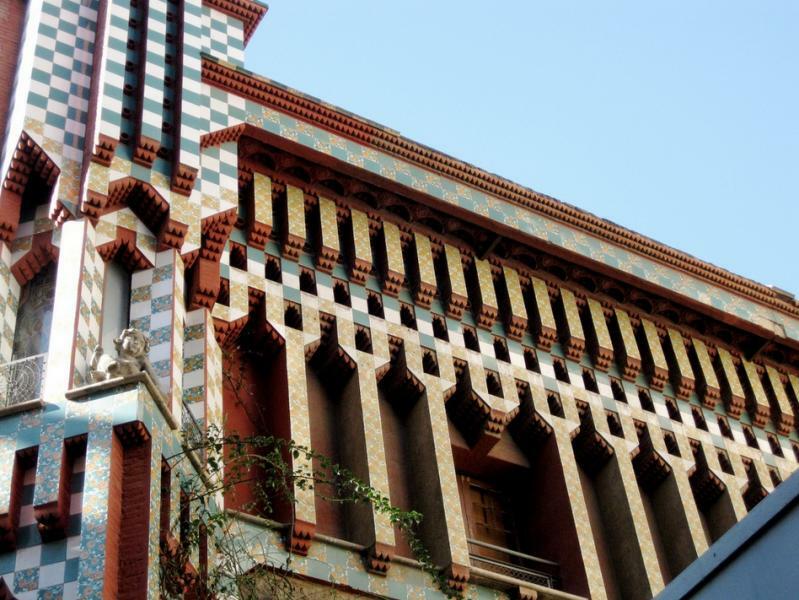 One of the first colourful buildings in Barcelona, it was designed as a summer villa covered with brickwork and chequerboard patterns of green and white tiles (Senyor Vicens was a tile merchant, but even so the house nearly bankrupted him). The delightful iron gate and fence of date-palm fronds, one of Gaudí’s most distinctive early works, has been attributed by some to his disciple, the then very young Francesc Berenguer. A series of frothy, wrought-iron balconies, full of dragons and bats, culminates in whimsical turrets, guarded by a cherubic statue of a pensive child. The interior is equally resplendent, ornate with ceramics and paintings including an elegant circular glass smoking room with its Moorish ceiling; the pure white staircase, in contrast, is like walking into an origami crane. From the start Gaudí concerned himself greatly with the siting of his buildings; originally the exotic garden was much larger (it even had a waterfall and small lake) and the house much smaller (it was doubled in size, with Gaudí overseeing the plans in 1925). There’s a story that, when a good friend of Gaudí’s mother came to Barcelona and was taken on a tour to see this and his other buildings, she wasn’t at all surprised. Antoni had been doing that stuff since he was a kid, she said. Hours daily 10am-8 pm, last tour at 6:30. Adm €16, students under 25, children 7-18, seniors over 65 €14; under 7 free. Guided tours extra €3. All types of tickets can be booked online.